Happy Friday, my style mavens, and hopefully foodies. After a little bit of thought, a lot of sushi, nights with friends accompanied by a slices of brick oven pizza, and breakfast plates featured with a side of coffee (all which have been dutifully posted on my Instagram), I have decided to add another feature to this lovely blog of mine, called Foodie Friday. This new feature will be a bi-weekly thing, hence the name, and not only feature food pics from some of my favorite foodie haunts, but also include a recipe here and there, or something food-related in general. This week’s captured image is from Garage Bar- one of my favorite local restaurants. The food is prepared with fresh, local ingredients (see all the drool-worthy vegetation above), and the atmosphere of this Louisville restaurant is like no other. Built around an abandoned service garage, ping pong tables and seating built out of greenery adorn the outdoor space, which lends to the perfect social setting when you are either waiting for a table, or wanting to linger with friends after you’ve enjoyed the eats. And if you don’t get your fill from the restaurant’s delectable wood-fire brick oven pizzas, then the multiple bar areas will provide you with an assortment of craft beer and a selection of Kentucky Bourbon- the best in the world. So cheers to a new feature, and to the many culinary adventures ahead! * The well- decorated wrist above belongs to my food-loving friend and fellow blogger, Lindsey Gumer of What’s That Taste Like. If you enjoy cooking and talking food, then she is definitely a blogger to follow. Love this idea And the pizza at Garage, so good! Everything looks so fresh and delicious! 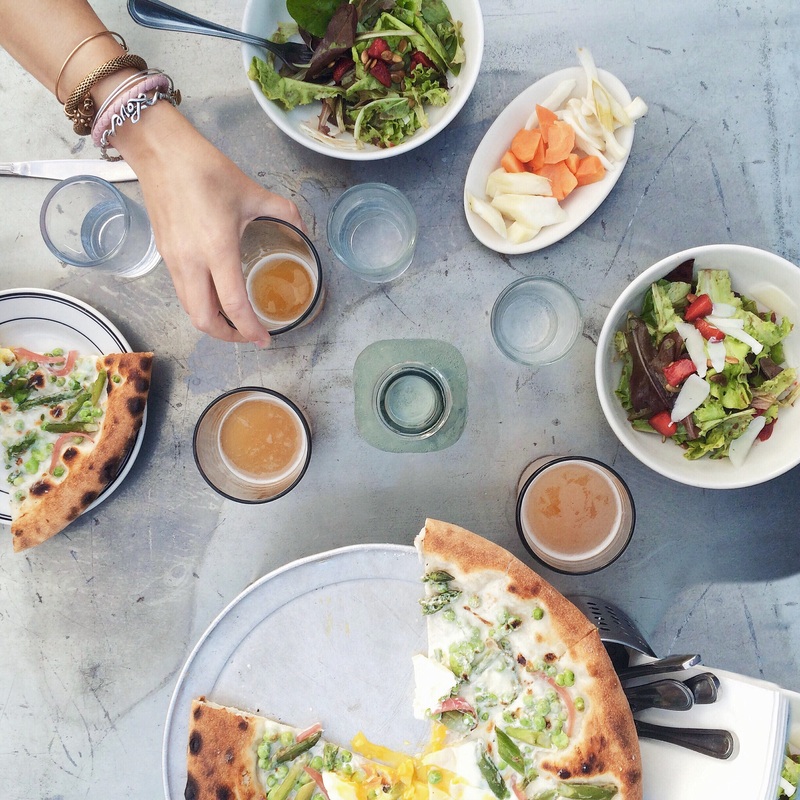 What’s better than wood-fide pizza and salad with friends right? Thanks for the review. I can’t ever say no to good pizza! Food looks absolutely delicious. Kentucky looks like they do it RIGHT! Love the new addition to the blog. Looking forward to Friday posts!